HAVING BEEN IN hospital recently for surgery to replace my portable life support system with a newer model I thought I would take this opportunity to celebrate the fifth anniversary of Soundlandscapes’ Blog by posting something close to my imperfect heart. For the last seven years or so I’ve been recording and archiving the sounds of Paris, the agglomeration of individual sounds which, when woven together, form the sound tapestry that surrounds our everyday lives in this city. When people ask me what I do I usually say that I’m a professional listener, or that I’m a flâneur, endlessly walking the streets of Paris observing through active listening. My sound work in Paris is influenced to a large degree by the late nineteenth and early twentieth century street photographers including, but not confined to, the work of Eugène Atget, Henri Cartier-Bresson, Robert Doisneau and Brassaï. 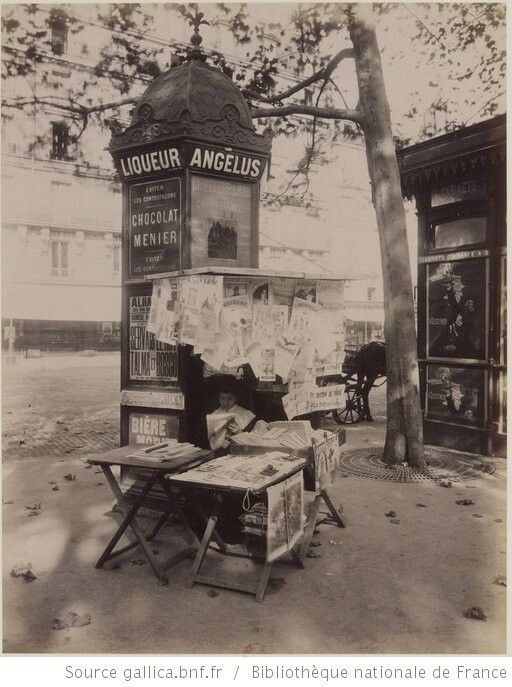 Eugène Atget for example created a tremendous photographic record of the look and feel of nineteenth-century Paris just as it was being dramatically transformed by modernisation while the others featured the human condition in public places. I’ve learned a lot about recording the sound tapestry of Paris from studying the work and techniques of these photographers. While these great photographers certainly influence my work the inspiration to begin my detailed exploration and documentation of the contemporary sound tapestry of Paris came from a different source, the French novelist, essayist, and filmmaker, Georges Perec. 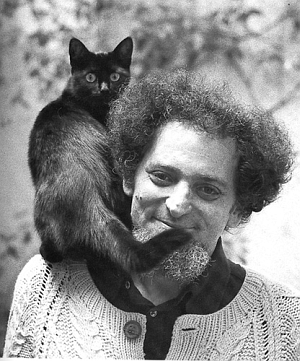 Georges Perec was born on 7th March 1936 in Belleville in the east of Paris, the only son of Polish Jewish parents who had emigrated to France in the 1920s. Both his parents died during WWII, his father from untreated wounds whilst serving in the French army and his mother in Auschwitz. Adopted by his parental aunt and uncle in 1945, Georges went on to study history and sociology at the Sorbonne, he spent a year in the army as a parachutist, got married and then took up a job as an archivist in the research library at the Neurophysiological Research Laboratory at the Hôpital Saint-Antoine, a job he retained until four years before his untimely death at the age of 45. Georges Perec’s talents ranged from writing fiction to compiling crossword puzzles for Le Point to creating the longest palindrome ever written to working in radio and making films. In 1965 his first novel Les Choses (Things: A Story of the Sixties) won the prix Renaudot and in 1978 his most acclaimed novel, La Vie mode d’emploi (Life a User’s Manual) won the prix Médicis and finally brought him financial and critical success. Just over eight years ago I emerged from a Parisian hospital after an uncomfortably close brush with death. Having been given a second chance in life’s lottery I was in need of a new challenge … but what? The answer came unexpectedly. Browsing around a musty second-hand bookshop one day I came upon a small French book, just sixty pages or so, written by Georges Perec, someone I’d never heard of. Scanning through it my first impression was that it was a journal of some sort, lists of what seemed like random observations. I was curious so I bought it for next to nothing. As I left the bookshop I could never have imagined what an impression this little book would have on me and how it would fundamentally shape my work in Paris. The book is called, Tentative d’ épuisement d’un lieu parisien, published in English as An Attempt at Exhausting a Place in Paris, and it’s a collection of observations that Georges Perec wrote down as he sat in Place Saint-Sulpice in Paris. The point of these observations was to record “ce qui se passe quand il ne rien se passe”, what is happening when nothing is happening. For three consecutive days in October 1974, Georges Perec flitted from one café to another in Place Saint-Sulpice recording everything that passed through his field of vision. Rather than describing impressive or notable things such as the architecture, he describes all the things that usually pass unnoticed. Il y a beaucoup de choses place Saint-Sulpice, par exemple : une mairie, un hôtel des finances, un commissariat de police, trois cafés dont un fait tabac, un cinéma, une église à laquelle ont travaillé Le Vau, Gittard, Oppenord, Servandoni et Chalgrin et qui est dédiée à un aumônier de Clotaire II qui fut évêque de Bourges de 624 à 644 et que l’on fête le 17 janvier, un éditeur, une entreprise de pompes funèbres, une agence de voyages, un arrêt d’autobus, un tailleur, un hôtel, une fontaine que décorent les statues des quatre grands orateurs chrétiens (Bossuet, Fénelon, Fléchier et Massillon), un kiosque à journaux, un marchand d’objets de piété, un parking, un institut de beauté, et bien d’autres choses encore. Many, if not most, of these things have been described, inventoried, photographed, recounted or recorded. My purpose in these pages was instead to describe the rest: what one generally does not notice, that which does not matter: what happens when nothing passes but time, people, cars and clouds. 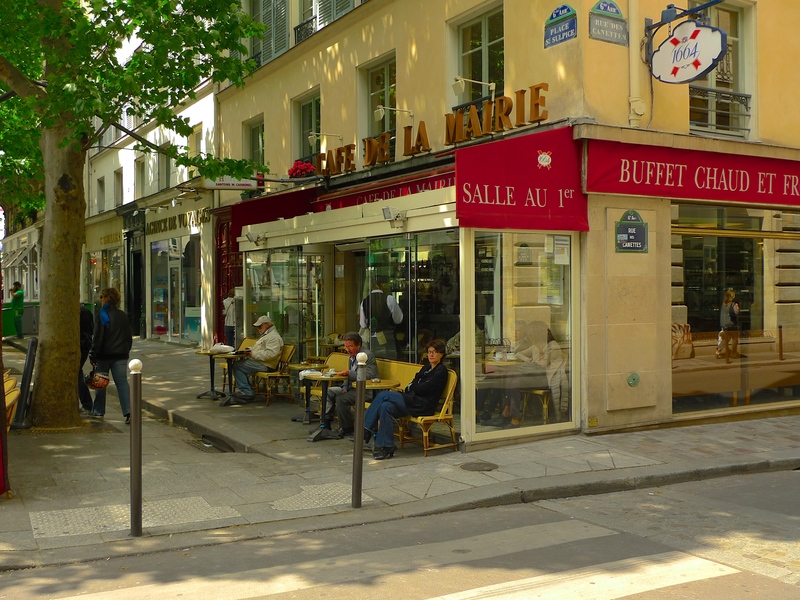 Georges Perec made his observations while sitting in three cafés facing the Place Saint-Sulpice, the Tabac Saint-Sulpice, the Café Fontaine Saint-Sulpice and the Café de la Mairie. When he got tired of one he would move to another. Today, only the Café de la Mairie remains. Tous les pigeons se sont réfugiés sur la gouttière de la mairie. Un 96 passe. Un 87 passe. Un 86 passe. Un 70 passe. Un camion « Grenelle Interlinge » passe. Accalmie. Il n’y a personne à l’arrêt des autobus . Une jeune femme est assise sur un banc, en face de la galerie de tapisseries « La demeure » elle fume une cigarette. Il y a trois vélomoteurs garés sur le trottoir devant le café. Un 86 passe. Un 70 passe. Un 63 passe. Un 87 passe. Il est une heure cinq. Une femme traverse en courant le parvis de l’église . Un livreur en blouse blanche sort de sa camionnette garée devant le café des glaces (alimentaires) qu’il va livrer rue des Canettes. Les automobiles suivent des axes de circulation évidemment privilégiés (sens unique , pour moi, de gauche à droite) ; c’est beaucoup moins sensible pour les piétons : il semblerait que la plupart vont rue des Canettes ou en viennent. Un 96 passe. Un 70 passe. Un 86 passe. Un 86 passe. Un 63 passe. 6 égouttiers (casques et cuissardes) prennent la rue des Canettes . Un aveugle venant de la rue des Canettes passe devant le café ; c’est un homme jeune, à la démarche assez assurée. I haven’t included the full entry for this particular observation session but you can see from this extract, whether you understand French or not, that Georges Perec is what one might call a contra-flâneur; he sits still and observes as the world moves by. Incidentally, the numbers that he lists are the numbers of the buses that pass and, as I could see for myself the other day, buses with the same numbers still pass. From the time I first discovered it, Tentative d’ épuisement d’un lieu parisien made a huge impression on me. I could immediately see how Georges Perec’s detailed observations of everyday life, his quest for the infraordinary: the humdrum, the non-event, the everyday “what happens when nothing happens” could be replicated equally compellingly in sound. That revelation inspired me to begin my own observations of Paris, detailed observations of the city through its intricate and multi-textured sound tapestry. Because Georges Perec inspired me to undertake my exploration of Paris in sound I couldn’t possibly have left the Café de la Mairie without making my own infraordinary observations of the Place Saint-Sulpice. From my contra-flâneur’s seat outside the Café de la Mairie, probably a seat once occupied by Perec himself, I recorded my own Tentative d’ épuisement d’un lieu parisien, ‘what is happening when nothing is happening’, which is both my homage to Georges Perec and my ‘Thank You’ to all the loyal visitors to Soundlandscapes’ Blog who have supported me over the last five years and who inspire me to continue with this work.